The third in a series of blog posts about the true costs of the clothing we wear. 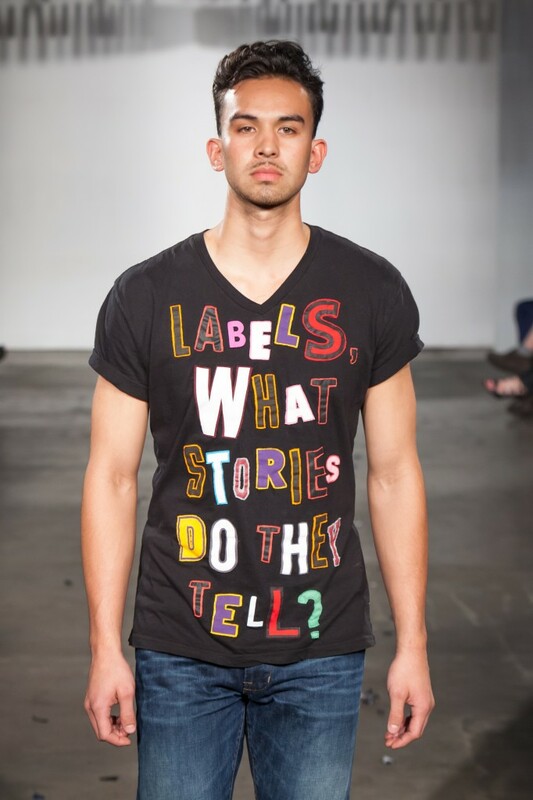 A T-shirt from my ECO FASHION WEEK collection. In my first post, I explained that through preparing new work for ECO FASHION WEEK, I took a deep dive into the environmental and social impacts of our clothing. In the second post we explored the world of fast fashion. Below I will use the journey of a simple T-shirt to underscore how the clothing industry is the second most polluting industry in the world after oil. Besides packing a landfill, other reasons the fashion industry is so polluting become clear when you think about the cradle-to-grave journey of a simple T-shirt. As we shall see, there are loads of instances where toxicity is released into the environment, populations of other countries are exploited and human dignity is compromised. Most T-shirts are made of a blend of cotton and polyester. Polyester is made from petroleum and the pollution from the extraction, refinement, transportation, and use of petroleum defines the first most polluting industry in the world. From oil spills, to water contamination, to air and soil toxification, to increased methane release we see the effects of pollution in everything the oil industry touches. 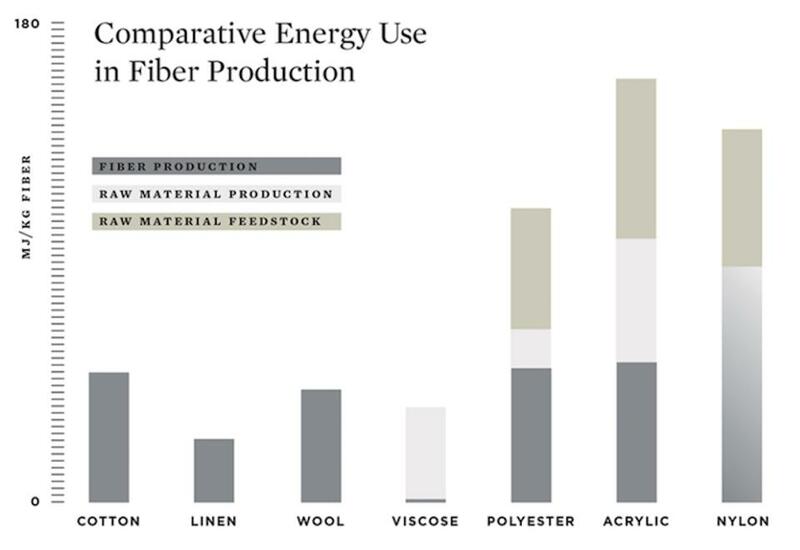 Additionally, creating fabric from petroleum is very energy and water intensive, from the extraction of the crude oil to the weaving of the materials from polymers.2 And the fabric particles (think, the lint in your dryer) never completely break down and instead build up in the environment. These are showing up in municipal waste water treatment plants and waterways everywhere, often referred to as contaminants of emerging concern or microplastics. Our T-shirt now needs to be cut and sewn. Clothing production in the United States has fallen dramatically over the years as companies have found people across the globe willing to work for much less money, in often unfair and unsafe conditions. According to a public broadcasting report “The Lowdown,” produced by KQED of Northern California, we went from 95% of American garments made in the USA during the 1960’s to 2% made in the USA as of 2013.6 Hundreds of people have been killed in fires and unsafe working conditions so that we can have the satisfaction of buying inexpensive clothes and getting “good deals.” Bangladesh saw one of its factories, Rana Plaza, collapse during April 2013, where over 1,100 workers were killed. 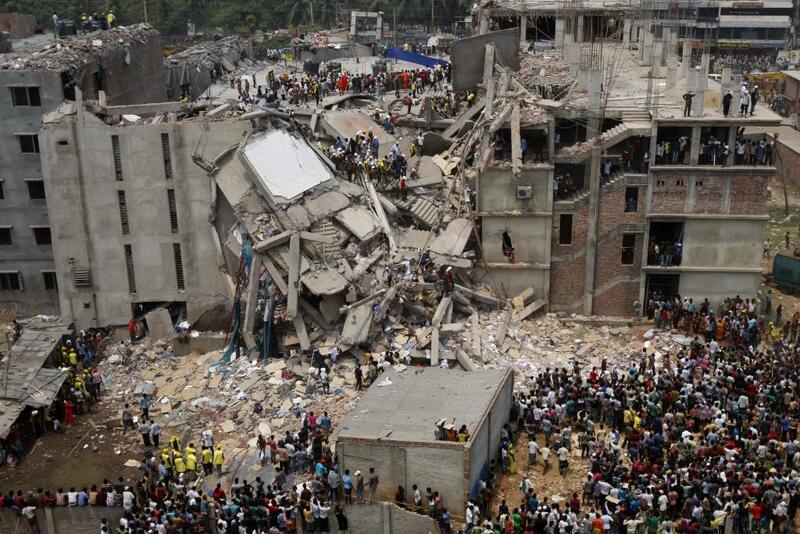 Prior to that in 2012 over 100 employees were killed in a fire at the Tazreen factory, also in Bangladesh. One of the reasons that foreign manufacturers are able to make our clothing so cheaply is their lack of regulation in many portions of the process. Many of these manufacturers employ children, and do not worry about the sanitation nor even safety of their workplaces. And they can be found engaging in both forced repression of unions as well as simple wage theft. Lastly, the entire business of clothing and textile manufacturing uses an enormous amount of energy and fuel. This process of growing/mining; processing/weaving; bleaching/dying; sewing; selling/buying; and wearing our clothing rarely happens in one place or region. Each stage requires transportation. Though global supply chains have the promise of efficiency to meet manufacturer and vendor deadlines without adding extra cost, they are transported by shipping containers on rail, truck, and ships using the worst of today’s polluting fossil fuels. Increases in transport by ships that consume fuel by tons per hour, coupled with their use of lower grade bunker fuel have increased the negative health effects to coastal and inland populations. 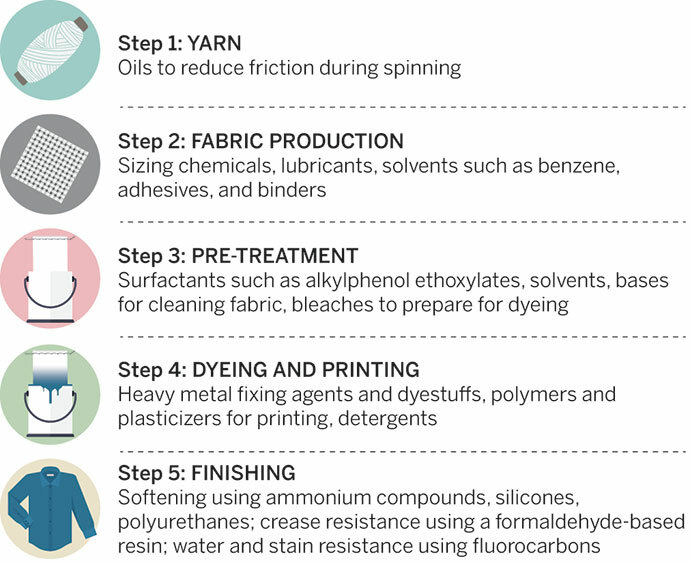 Making polyester uses 70 million gallons of oil each year. To manufacture rayon and other fibers from cellulose, we harvest over 70 million trees a year. 24% and 11% of insecticides and pesticides global manufacturing, respectively, is used to produce the world’s cotton. This is the quick story of a simple T-Shirt, imagine the process for more complicated items like shoes, rain coats, dresses with sequins, etc. Even clothing purchased from more “reputable” brands and stores are mostly created from the same problematic materials and in overseas factories that require a great deal of transportation. NOW, perhaps you can see why the clothing industry is the second most polluting industry in the world! In my next blog post, I will talk about how all this information informed the collection and performance piece I created for ECO FASHION WEEK, and in my last blog post we will explore what we can do as consumers to reduce the negative impacts of the clothing we purchase and wear. Photo Credits: Runway photo by Peter Jensen. Interesting information. 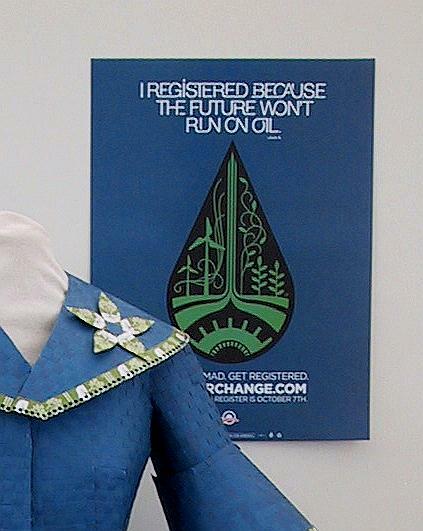 Are your going to talk about the environmental impact of shipping the clothing? That is something I think of when I see the country of origin labels. Well done Nancy. Thank you for educating me. Hi Nancy, what would you advocate for large non-profits such as Blood Centers of the Pacific (as well as many wonderful annual event producers) that are consistently buying large volumes of tees for promotions & volunteers? more & more ‘organic cotton’ & hemp tees are being sourced for these causes but still as you’ve noted tons of education is needed on these topics…..your efforts are greatly appreciated! This is a great question Chris! I would first suggest not giving T-shirts away anymore! I know this feels like a big step because people have come to expect SWAG for volunteering and at events. But perhaps it could be made into a “teachable moment” about how these items do not promote environmental or human health. If that feels too radical, perhaps considering giving away items that promote the cause of the organization. Reusable bags and water bottles come to mind. I know they are not “carbon neutral”, but at least they can promote the mission of the organization, which shirts likely do not. Plus there are enough T-shirts in this world! I hope this is helpful, if you want to discuss in more depth my e-mail is: nancy@RecycleRunway.com. any groups within the United Nations who also are addressing these and searching for solutions? Keep it up! You and more like you are needed in this world. Hi, Nancy, wonderful article! Important stuff! Sorry, if I missed it (I’m reading this on my phone), but an important factor in the life cycle of clothing is the laundering, I bet! And, on the plus side of cotton clothing is the probably small but possibly significant amount of carbon sequestration that cotton represents. Take care, and keep up the good work!